Finally. That’s what I kept thinking as I read through Dr. Bob Sears’ newest book, entitled, “The Vaccine Book: Making the Right Decision for Your Child” (Little, Brown, and Company, 2007). For a long time, I have wished that there was a comprehensive resource about vaccines from someone I could trust. I admit that I have a somewhat weary suspicion of most M.D.’s. I try to trust them, to think that they are making decisions because they care about my precious little girl with her sparkling blue eyes, her winning smile, and her gurgling laughter. I hope that they are not making decisions because of money or lack of time or pride, but that hope is often overshadowed by skepticism of a flawed industry. That’s why I was overjoyed when I heard it was Dr. Sears who authored the book. I trust the Sears family – their gentler, warmer, more humane way of addressing patients and parenting. I appreciate their more natural approach – their stances about breastfeeding, babywearing, and co-sleeping (they’re advocates of all three). I was not disappointed. Dr. Sears has created a thorough, detailed analysis of each vaccine (pros, cons, ingredients, side effects, etc.). Although it is obvious that Sears knows his stuff, his voice is warm and professional, not sterile and condescending. He answers common questions with grace. But he doesn’t provide easy answers or gloss over the debate. In fact, I found myself floundering a bit when I closed the pages, still uncertain by the vaccine dilemma, a bit overwhelmed with all of the data. I did feel more knowledgeable, however, and I felt like I would come back to this book many times to thoughtfully revisit the concepts. The Vaccine Book is the only book of its kind on the market. It is objective without some elephant agenda (ant-vaccine or pro-vaccine). It is clear and it is parent-friendly. The back of the book promises that it is the “first-ever, authoritative, open-minded guide to childhood vaccines” and that synopsis rings true to me. I highly recommend this book to any parent who has ever wondered about vaccines, any parent searching for answers that are backed up by research and experience. This is one purchase you are unlikely to regret. WIN IT! Here’s your chance to add this excellent and important resource to your library. All you have to do is leave a comment and your e-mail address on this post by Sunday, November 11th, at midnight. The winner will be announced and contacted by e-mail on Monday, November 12th. *Winner must have a U.S. mailing address. It really isn’t an easy topic is it? It wasn’t easy for us to come to the decision we made. And sometimes I question if it was the best one. I think that one of the possible options that could ease parents minds on both sides is to delay, delay, delay. And be picky. I don’t feel that every vaccine they want to give my child is truly needed. Good overview of the book! I’ve read about this book, and have been meaning to get it. I’d love to win, count me in! Baby #1 is due in exactly one week – this would be a great book to have around. Please enter me! Please pick me! I’ve been struggling with the vaccine decision for son #2 (who is now 3 months old). I need more info! Thanks! I love Dr. Sears! Thanks! I’ve been hearing more and more about this issue and it has become more relevant as Baby#2 is about to make his appearance. I would love to win this book. I have done a lot of research on vaccines myself and it continues to frustrate me. I would love to see what Dr. Sears has to say about it as I agree with him in many other areas. This books sounds great! New moms are always looking fo new information! This look slike a really interesting book! I’m due with a little boy this week. I’ve been struggling the last few weeks over when, how and if to vaccinate. It sounds like this would be a helpful resource as I make this important decision. I would LOVE to have this book for my daughter who is expecting her first child. 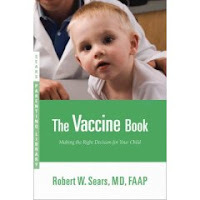 All the vax info I’ve been reading is pretty scary – it would be nice to hear what Dr. Sears has to say. I’d love to have this book. Right now my husband and I are divided on this issue. I need to study up on vaccines as I am due anyday now. Thanks for the chance! I’ve been overwhelmed about the vaccine issue and this book sounds like it would at least help me make a more intelligent decision. Baby #1 is on the way and I have been hearing so many different things about vaccines. I saw this book the other day and almost bought it. Maybe I will be lucky enough to win it instead! Please please Please pick me! I need this book so bad. As you know this has been a HUGE struggle for myself and my husband. I really could use this book! I really, really would like this book! I feel so overwhelmed by one side saying you will kill your kid if you vax and the other you will if you don’t. I would love some REAL information to make up my mind! I would so love to win this. I’ve always found the Sears boks to be a fantastic reference! There is so much controversy regarding vaccines, and I would love to have this book. I have an 8 month old daughter and we are waiting with shots for her. I am not even sure we will…but it would be great to have this to maybe come to a more understanding about all those shots. Thanks for the chance to win this book~! It looks great! I would love to read this and find out all the info about the pain I’ve been putting my kids through! I have been wanting to read this. As a nurse and now a mom, I’m so glad this book was written, particularly by a well-known, credible physician. I too greatly respect Dr. Sears methods and would love to read his take on this topic. I’d love this book. Thanks for letting us know about it. This would be good. My baby is in the middle of getting a ton of vaccines. I read a review by a friend who got the book and went to hear him speak. She loved it. Very friendly to parents who don’t vax or delay vax. This book is the closest in book form that I have heard to the truth about vaccines. I am looking forward to reading it. Hey! I have a new baby and this would be so helpful in deciding what vaccines I would/would not want my son to have. Thanks for such a useful giveaway. My mom is a Doula and would love to have this book. this sounds like a resource we all need!!! I would love this! I have been wanting a good resource about vaccines for a long time! Oh boy, I feel your pain. Our little one is now 12 months old, and she’s due for a ton of vaccines. I didn’t think too much about this before, but now the debate is so hot in the media you can’t help but be concerned. I’ve not been disappointed with Dr. Sears at all, we babywear, cosleep, and attachment parent as well. I’d love to read the book. What a dilemma this stuff is. I wish the CDC would look into this stuff from every angle so we wouldn’t have to fret over this stuff. My contact info is on my blog. Thank you for this neat giveaway! Finally…a trustworthy resource. Can’t wait to read it! I would love to win a copy for myself! oooh! I’ve been looking for a book like this for a long time! I really appreciate all of Dr. Sear’s other books, and would love to read about this book. In fact, I would like to blog about it too! I would love to read an objective book on the subject. Interesting- I love the attachment parenting methods that Dr William Sears pioneered so it wouldnt hurt to learn more about vaccines. Thanks! I would LOVE to have this book. As a concerned parent, my son has only had the DTaP and Polio vaccines. The MMR is very questionable for me because of the link to autism. It’s so scary! I would love to have this book as a resource. Love to see what he has to say on the subject. I have to admit it is all confusing. this looks like a worthwhile read for the care of infants/toddlers. Would love to win this book! I’m really interested to read this book! Fingers crossed- I hope to win!! I need this book. If I don’t win, I’ll definitely buy it. I’m adding it to Wed. Edition of Contests Galore…. running late today. I wish I had found your blog sooner. I have enjoyed reading your past entries. I would love a chance to win this book just to see exactly what it says. I am a firm believer in vaccines (except for the flu and chicken pox) but I am always open to new and most important un-biased ideas. This one seems to be un-biased and pretty straight forward. i’ve always wanted some info on this! I have been thinking abut getting this book… baby #2 is on the way and I am getting more and more worried about vaccines this go round. I would love to have a copy! I would love to read this book, more infomation never hurt anybody.